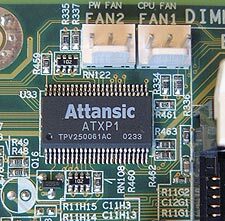 Abstract: Based on the same nForce2 SPP (System Platform Processor) you can already guess that that the FIC AU11 is going to be fast. 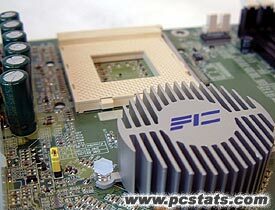 It's funny, we used to drop in the PCstats.com Heatsink Clearance Measurements chart in tons of reviews last year, but for months on end we've barely seen hide nor hare of AMD motherboards in the labs. The onslaught of nForce2 boards which are hitting the market seem to be changing this trend back toward more normal levels, and so once again we bring you these oh so critical clearance charts. The AMD AthlonXP is a toasty chip, so many of our readers like to know what is the largest heatsink that they can slap on, or in some cases bolt on to the motherboard. Since AMD doesn't currently use any standardized heatsink retention mechanism there is a lot more freedom in terms of the overall size an Athlon heatsink can take. Throw in the mixed layouts of many different mainboards and you have a problem on your hand. Not all AMD heatsinks will fit cleanly on all AMD motherboards, especially if the heatsink is large, or requires the use of now obsolete mounting holes. Note: Approx. measurements are made from the edge of the socket (not the clips) to the closest obstacle taller than the ZIF socket itself. The socket is 51mm across, and 62mm from top to bottom. FIC has done a superb job clearing the CPU socket area. This is probably the most spacious motherboard we have ever used and the AU11 even has the four mounting holes! You definitely will not have problems installing larger heatsinks like the Alpha PAL8045 or Thermalright SLK-800. Because the Power Fan Header and CPU Fan header are side by side, you must make sure you plug the HSF into the right header! If you plug the CPU fan into the wrong header, there's a possibility you could fry your processor when the board goes into hibernation (sleep mode). We really didn't know what to expect when it came to overclocking the FIC AU11. Our other nForce2 based motherboard, the MSI K7N2 was not a good overclocker with the AthlonXP 2700+, but I have also heard many users go past 200 MHz FSB as well. None the less, we began to raise the FSB slowly. We easily pasted the 175 MHz mark which was what the MSI K7N2 maxed out at, and continued up past the 180 MHz FSB mark! At 183 MHz FSB the FIC AU11 said enough, and wouldn't budge a single bit more. Not bad, but not quite 200MHz FSB either.